Quickly gain control when there’s water gushing from your commode. Q: Help! Just as I was leaving the bathroom, I heard the unmistakable, undesirable sound of water hitting the floor. Looking back, I saw the toilet overflowing! I turned off the water—but what do I do now? A: An overflowing toilet is a problem everyone will likely deal with at some point. When water issues from the bowl, chances are the culprit is a clogged toilet drain—usually an easy fix with some basic tools. You’ve already done the right thing by turning off the toilet’s water supply, on the wall behind the toilet. If you can’t find the water supply to stop the toilet overflowing, take the top off the tank and lift the float ball or cup high enough to stop the water from running. Then shut off the water supply to the house with the valve or knob generally located near the water heater. Should overflow continue once the main water supply is off, you’re dealing with sewage backup, a serious situation requiring an immediate call to a plumber. If you are on a municipal septic system, the plumber can diagnose whether the issue is on your property or something you need to call the city about. If you have a septic tank, you’ll need a plumbing company that can flush out your system. Hopefully, though, the gushing will have stopped and you may proceed. When you’ve fixed the toilet, make sure to clean the bathroom and tools thoroughly with bleach and hot water. Plunge a Clog. The first line of defense for a toilet clog is the standard plunger. If you don’t already own one, invest in one with a flange on the bottom that will extend into the toilet’s drain hole, creating the tight seal that will clear the clog most efficiently. But before you grab the plunger, put on some rubber gloves and remove a few inches of water from the toilet bowl into a bucket with a small container to minimize the risk of sloshing more onto the floor as you plunge. It’s also a good idea to throw a few old towels around the base of the commode to soak up any water that may come out. Put the plunger into the toilet, inserting the flange directly into the drain hole. Tip: To ensure a tight seal, coat the rim of the flange with petroleum jelly. Keeping the handle upright, vigorously push the plunger up and down for 15 to 20 seconds, an action that forces air and water into the drain to clear the clog. Flush to ensure that the problem is, ahem, behind you! Snake a Drain. If a plunger fails to do the trick, the next step is to use a toilet snake, also known as a toilet auger—a flexible cable designed to maneuver the twisty turns of the toilet drain. The cable, housed in a rubber hose, has a crank on one end and a coiled hook tip on the other that can snag stubborn materials deep within the drain. A toilet snake costs around $50, but you can rent one from a home improvement or hardware store for about $12 to $15 a day—even less for half a day. Don your rubber gloves and remove excess water from the toilet into a bucket with a small container. Then place the hook end of the toilet snake into the bowl and begin turning the crank clockwise so the cable extends into the drain. Keep cranking until it won’t go any further—you’ve come to the clog. Gently pull back on the snake and, if you feel resistance, you’ve hooked the clog. Begin cranking counter-clockwise to pull the clog out of the drain back up into the toilet bowl. Dump the clogged material into the bucket and repeat the process several times to ensure that the clog is completely removed. 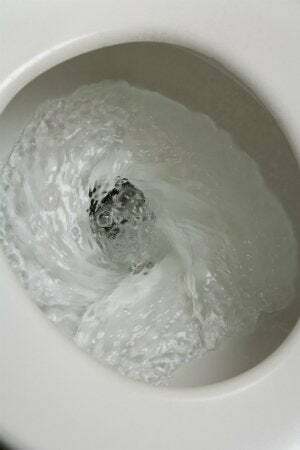 Flush, then dump the waste back into the toilet in small amounts, flushing each time to make sure you don’t create another clog or start the toilet overflowing once more.